The TomTom Go 6000 offers a fantastic navigation experience, with included traffic and a vast 6-inch display. There's little benefit, however, other than sheer size over the Go 5000, so those looking to save space and cash may be better served by the smaller model. With more people slipping a smartphone into their pocket, and most now offering free turn-by-turn navigation, TomTom is having to evolve to keep customers interested in personal navigation devices. Is the big-screen TomTom Go 6000 the high-end answer? As part of that evolution we've seen a complete reworking of the satnav interface, an improvement of the touch response and a rethinking of how the additional products and services are offered by TomTom. We've previously reviewed the TomTom Go 500, a device that relied on your smartphone for a connection, but that's not the only route to TomTom navigation. The Go 6000 offers an all-in-one solution, with it's own connection. But is this monster of a PND worthy of your consideration? Unlike smartphones, there's only so much you can do with a satnav. Its nature means it's dominated by a display and unlike a phone you need to spend little time holding it, so the shape of the back and the dimensions are perhaps less important than on other devices. The Go 6000, as the name sort of suggests, has a 6-inch display on the front - so this is a big device. It measures 169 x 105 x 20mm and it weighs 292g, although once attached to your windscreen, little of that matters. It does, however, take up a pretty decent sized chunk of windscreen space. We tucked it into the corner of our VW Passat without a problem, but we can't help thinking it might be better suited in a bigger vehicle, like a campervan where the windscreen is larger and further away. That's a point of personal preference and if, like us, you think it offers more display space than it needs to, then you can get exactly the same features in the TomTom Go 5000, with a 5-inch display, for £50 less. The build feels good, however, as the Go 6000 is a well-made sturdy lump of a device. 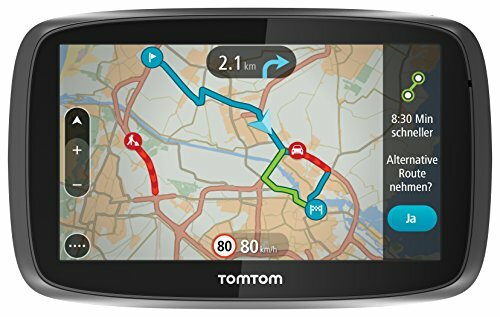 The finish in black and grey is typical of TomTom - not quite "colouration" in these shades - and it isn't an unnecessary distraction once you're driving. We've long been fans of TomTom's considered approach to windscreen mounts and the latest iteration is fuss free. You simply offer the sucker up to the windscreen and twist the lock and it's secure in place. We've found it to stay in place every time and the swivel connection to the device mount means it's easy to get the angle you want for your TomTom. In the past there have been some questionable connection options for satnav devices. Some you have to slot into a cradle, some you have to press hard to get a latch to engage, but the latest from TomTom uses magnets. That means you can simply slot the bottom connections into the device and let it rock back where it's held securely in place. If you want to remove it, you can simply pull it away, however it's secure enough to stay in place on bumpy roads. The aim of the new TomTom interface is to bring simplification. That's achieved by a lot of clutter, menus and steps being stripped out - the main function of navigation is much more immediate. A single tap to the screen will now access the menu and you're presented with a big search option up front. All of the options are related to navigation - your route, your place, parking, speed cameras, fuel - without the distraction of other elements that previously you'd have to step around. There's an additional settings menu right at the end of this first linear array of icons, which then lets you change things like your route planning options or your device preferences. Searching is now a single integrated experience too. You can start plugging in your destination address or postcode and TomTom will start searching for addresses or points of interest. You can also put company names in to find what you're looking for - rather than the older system of searching through types of POI - but the results are only ever as good as the database. It would give us some locations on our local high street, but not others. For example, searching for Boots (the chemist) it wanted to take us two miles rather than half a mile down the road, while for the Go Outdoors camping superstore it suggest a number of locations but missed the closest. The long and short of it is that if you're looking for a particular company or chain, then it is worth checking on your phone too, or you might miss the closest one. Some might feel that there are now less features, because you can't just dive into some of the options that were previously available. If you're an existing TomTom owner, that will probably be your first impression, but in reality, once on the road, this is TomTom giving you A to B navigation in a clear and uncluttered way. The traffic elements, which are central to this model, don't give you the same variety of options as they did before - you just have to concentrate on driving and leave TomTom to sort things out for you. That means you're putting your trust in TomTom's route navigation and traffic integration. It might seem like a leap of faith, but for a number of years we've considered TomTom to be the best at picking out a route. We've used the TomTom Go 6000 on a number of journeys, including alongside in-built satnav systems and TomTom always managed to find fastest route with minimal fuss. The integrated traffic information will just take care of your route and if there's a faster option available, it will be suggested to you. The change from previous TomTom devices is that there doesn't appear to be a way to force a new route around the traffic. You used to be able to sit in a jam and allocate a part of the route to avoid and now you can't. It seems that TomTom will leave you in the traffic jam if waiting is better than diverting, which it often is. The headline sell of the TomTom Go 6000 is the integrated connection to TomTom's traffic system. On the TomTom Go 600 you would need to connect to your smartphone via Bluetooth to gather this information, but in the 6000 - as well as the smaller 5000 - that's not necessary. That makes the Go 6000 a better option for those who don't want to connect to a phone, be that because of the lack of data tariff, roaming charges, or because you think it might be too fiddly. The 6000 comes with European mapping covering 45 countries, of which 25 are covered by TomTom traffic. You'll also get free updates to those maps with TomTom promising four or more updates to the maps each year for the lifetime of your device. Traffic is presented in a sidebar so you can see what is coming up on your journey. As you approach the traffic on the road, it will appear on your navigation map and you'll find it can be frighteningly accurate. It's worth noting, however, that there are no phone features on the Go 6000 at all - you can't connect your phone, place calls, access your contacts for addresses or anything else. Bit of a shame. When it comes to the actual navigation, TomTom's route planning is fast, as is re-routing. It's also fairly quick to realise if you happen to ignoring it and stop trying to divert you back to your planned route, instead plotting the route ahead instead to get you to your destination. Instructions are loud and clear and it's easy to adjust the volume, so you can hear instructions over the noise of your engine or kids - or both if you're really (un)fortunate. Clean instructions are displayed for you to follow, including lane guidance to help you navigate junctions, or just to get yourself in the correct position when it comes to leaving the motorway. If we had one criticism of TomTom navigation on dual carriageways and motorways, it's that it can sometimes be a little unclear how much of the instruction relates to slip road or not, especially when junctions are close together. But the majority of the time, especially around unfamiliar suburban areas, TomTom makes it easy to find obscure places. The larger display doesn't really give you a huge benefit when all you're doing is following a blue line through a grey background. But it will give you more results on the page when you're searching, which means less scrolling. As we said, traffic is integrated into the sidebar that follows your progress through your journey. If there's an incident identified, you can click on it and find out what the problem is. When planning journeys, you'll also have fuel stations listed here so you can opt to add it to your journey. There's also a menu option or fuel, so if you ever think you need to fill up, you can just head there and add it into your route. If you're after excellent navigation, a traffic system that's second to none and all on a big screen, then the TomTom Go 6000 is what you want. However, we feel it is too big for normal car driving, so we'd opt for the Go 5000 instead. Although we've not had the latter model in the office to test it gives the same all-in-one experience, but with slightly smaller proportions and for £50 less cash. Priced at £300, the Go 6000 is expensive. There's value in the lifetime traffic and the lifetime map updates, but if you're after speed cameras too, they will need an additional subscription - and that's an extra £20 for 12 months. There's also value in the connection to TomTom's traffic services across Europe, without having to worry about data charges incurred by roaming - certainly a benefit to those regularly driving in Europe for work or holidays. Overall, we can't fault the navigation options offered by the TomTom Go 6000. We like the clear interface and the slick touch response and we've been very happy with its performance. For us, however, it's just bigger and more costly than it needs to be.